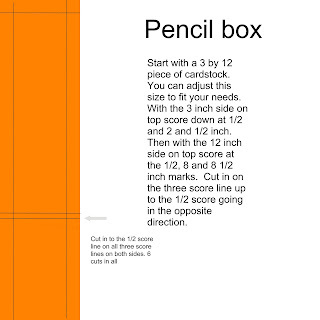 How to make the pencil box previously posted. For the kids! 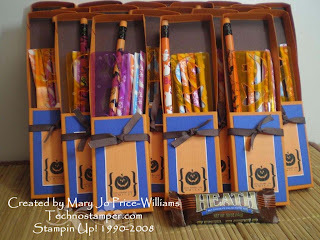 Heath Bar inspired pencil boxes. Re-cap of sketch challenge 92 players. 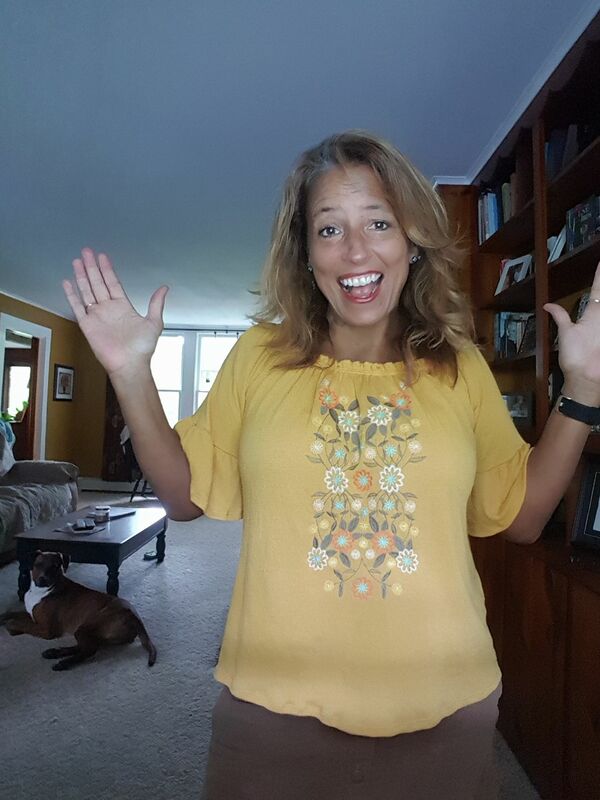 SUDSOL challenges--Getting closer to my goal! Monday Lunchtime Sketch Challenge 90 -- WHAT?? Re-cap of sketch challenge 91 players! 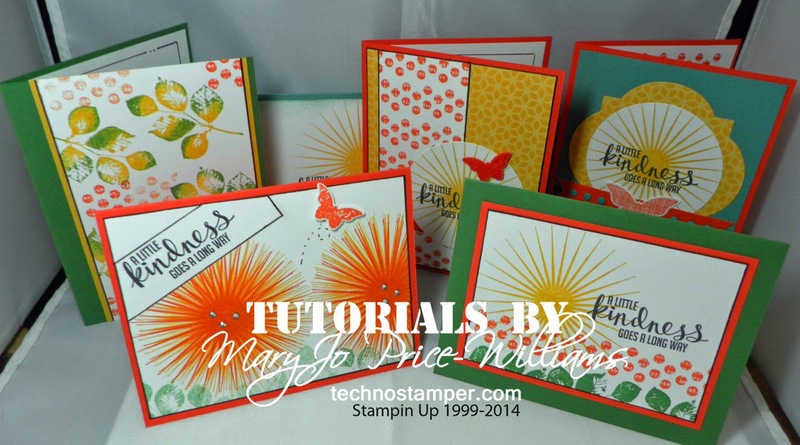 Big Giveaway all Stampin Up! 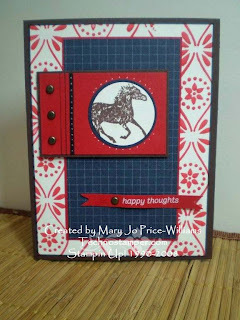 This first card is for the sketch challenge on SCS this week. It was a fun sketch. 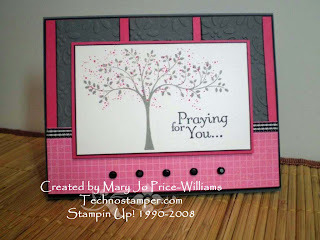 I am sending this to a friend and her family as they struggle with cancer. 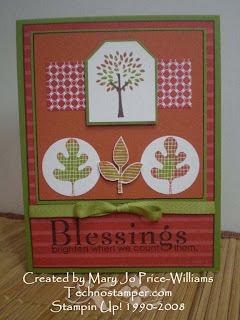 This next one is the the SUDSOL case a Stampin Success Challenge. They pick a different card each week to case. Fun challenge, come on and play along. Have a ton to do today so I am off. Happy Friday!!!!! 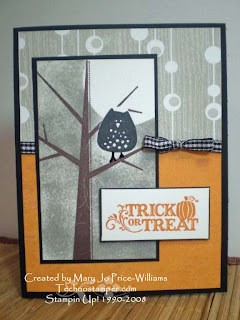 Today's Blogger's challenge is all about Halloween. A fast card for today. I am not much of a Halloween person other than making treat items for the kids so I do not have very many Halloween stamps. 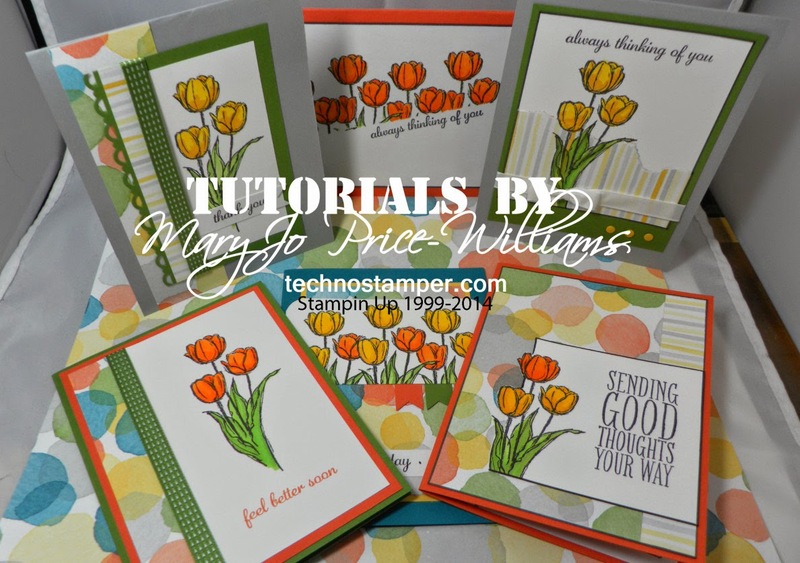 But us stampers can always make due with what we have--we usually just don't want to--we want it all! That is it for now, I have more challenges to share later today. You can click on the picture to enlarge. I made this mini tutorial with the MDS. Only a few minutes. Not sure how it will work, lol. You can click on the picture to enlarge. I made this mini tutorial with the MDS. Only a few minutes. Not sure how it will work, lol. Here is the picture of the finished project which was also partially done with the MDS. Let me know how this works for you if it is too hard to figure out or if it is ok. Thanks. 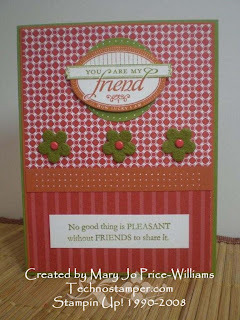 This week Kerry challenged us to create Teen cards. 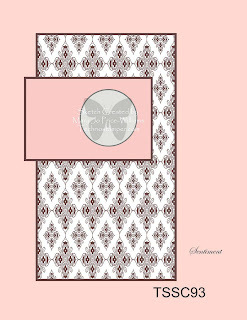 This is a genre I do not make many cards for so it was quite challenging. 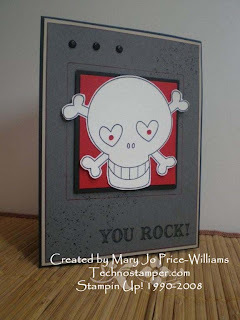 Especially since I wanted to use 100% current Stampin Up! 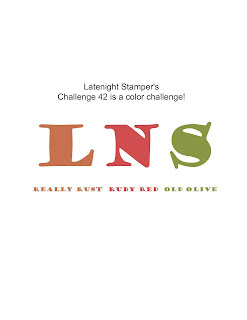 and combine at least one card with the Latenightstamper's challenge for the week. Remember the challenge there is to use colors from any type of candy. Well I think I pulled all of this off--amazing, I know, lol! I decided to make one for a teen girl and one for a teen boy. Why not make it even harder ya know. The girl card is the one that I was able to use a candy wrapper for the colors. I have to admit I would NEVER of put these colors together but I kind of like them. What do you think? The next card is for a teen boy. I love this set and don't use it enough. Other: ruler, marker, hand held punch, brads. 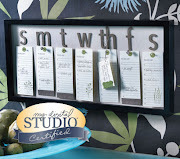 Don't forget to held over to the Three Clover's Designs blog to see what the rest of the team did with this theme. ETA: You can find the directions for this at this post HERE. Still working on my samples for this week's Latenightstamper's challenge to create a project using the colors that you find in a candy bar. I love the colors on this Heath bar and I love the taste of them even more! I needed to make something for the kids in my son's class for Halloween and didn't want to give too much candy so I made these pencil boxes and put in four pixie stick, a Halloween pencil and a Halloween stencil. The pencil boxes are so easy to make. 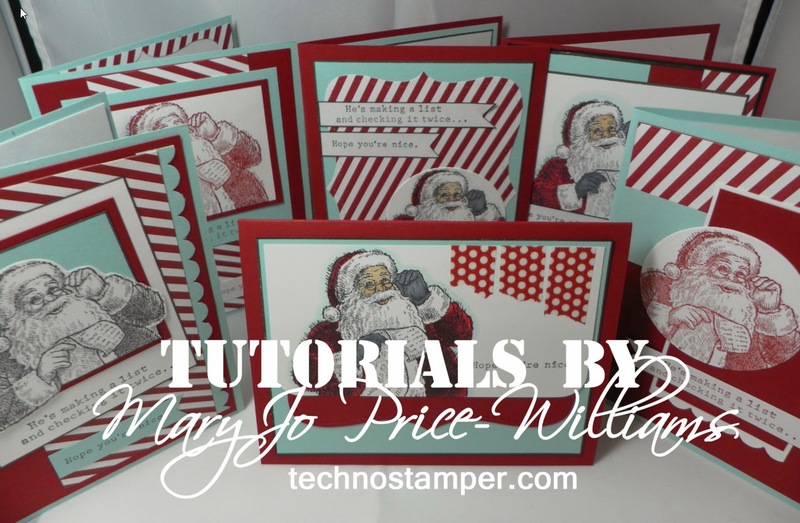 You start with a 3 and 1/2 inch by 12 piece of card stock. With the 12 inch side on top you will sore at 1/2- 8 and 8 and 1/2. 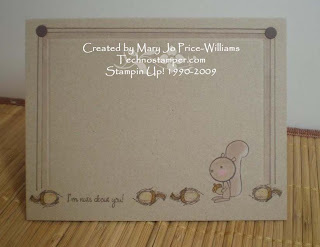 Then turn the card stock so the 3 and 1/2 inch side is on top and score at 1/2 from both sides. I will make a tutorial if there is interest. Other: computer, MDS ribbon, scoring blade, Halloween pencils, pixie sticks, Halloween stencils. Thanks for stopping by today! Hope you are having a fabulously blessed day! Wow did this week go fast! Today was the Chili Cook-off/Bake-off that I run at my church. I love this event. It is so much fun, lots of fellowship and some wonderful chili and dessert too! You can't go wrong. I really enjoy this and I use it to finish off my CROP walk. All of the proceeds from the Cook-off go to the CROP hunger walk--now I can turn that page for this year. Time to look on to the next events. 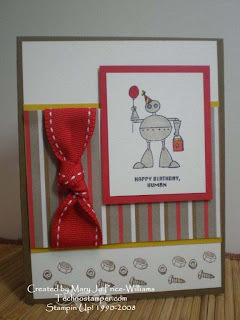 I have a quick card for my sketch challenge today and of course I combined it with the LNS challenge. Now that I am a co-leader over there I will be combining my sketch with that challenge as much as possible. Sometimes that won't work if they are both sketches but that does not happen too often. Here is the sketch for this week--made it on the MDS again. I haven't pulled out the Wanted set in a while so I thought it would be a fun one to us. 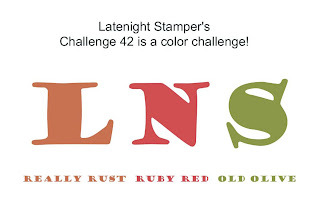 The LNS challenge for this week which I combined is a really cool color challenge. 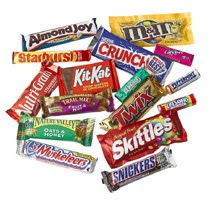 With Halloween right around the corner, and all the stores carrying my favorite candy, my mind seems to be stuck in a permanent sugar high. 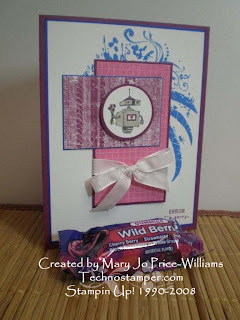 This week design a card using only the colors found in your favorite candy wrapper. I chose to use the colors in my favorite candy bar Snickers--real red, night of navy, chocolate chip and whisper white. Come on and play along with one or both of these challenges. If you play along with my sketch challenge be sure to come on back and leave a link on Mr. Linky below so I can add you to the re-cap next Sunday! Hope you have a fabulous week! What a selection of cards this week, we have elegant, cute, fun, pretty and everything in between. Thanks to every one who joined in this week! Great job as always. Be sure to check out what the other gals have done with this challenge. The links can be found by clicking on the Blogger's Challenge logo on my sidebar. I have missed a few in a row but it is good to be back. 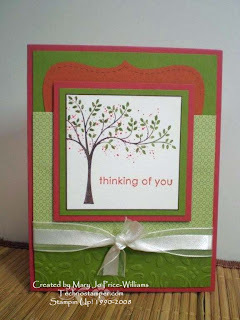 This week Kerry at Three Clovers Designs has a sketch for us! Great week for me to come back since EVERYONE knows I love sketches, lol! Here is the sketch. And of course my card. I made mine a 4.25 square inch card. I really love this size! I love these colors too. I need tons of thank you cards for the CROP walk. Please be patient waiting for them if you contributed in any way. 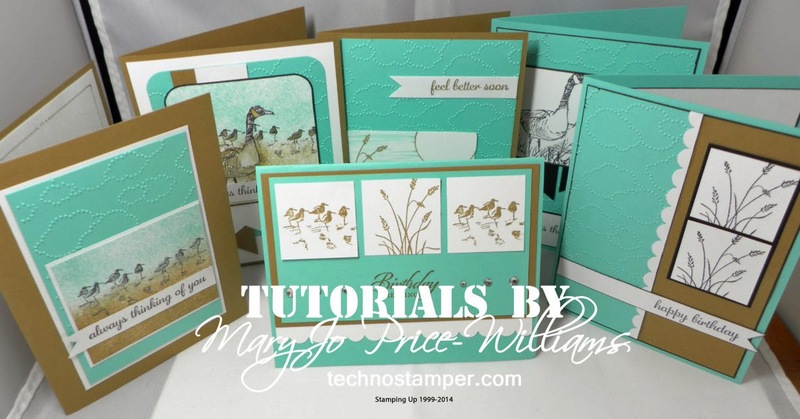 See ya tomorrow with the Blogger's challenge. Catching up with some Sudsol Challenges. Why not come on over and play along. 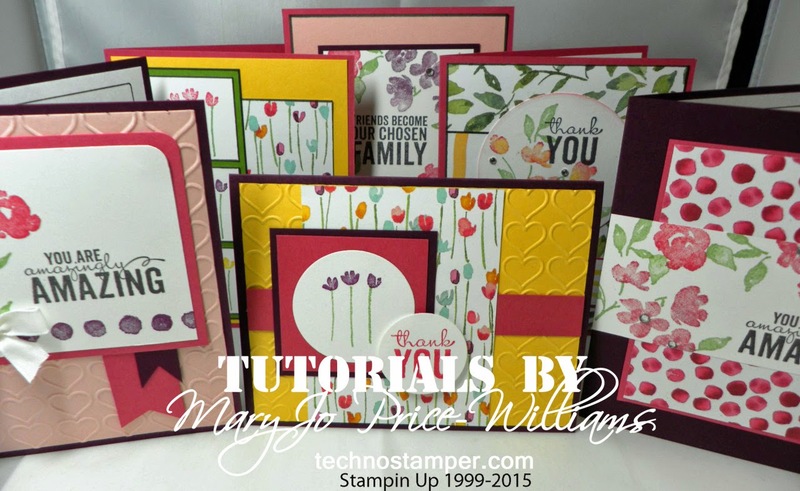 You do need to be a Stampin Up! demo to join but if you are a demo you can get a free two weeks by clicking the link on the left side of my blog on the sidebar. 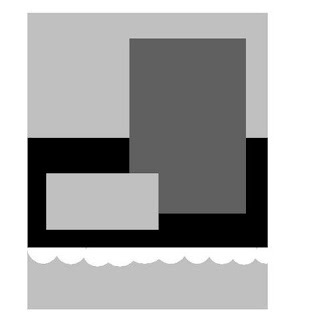 Great site with so much business stuff and now challenges too! The fist is the CASE challenge. Here is the card we were to CASE. And my sample. I think this is such a simple yet cute card. Thanks for stopping by today! Hope you have a blessed day. Finally the announcement we have been waiting for--who won all the SU supplies??!! Well actually we have two winners. The first winner only wants a few things out of the pile because they have most of it, imaging that--a stamper having a lot of stuff! So she said to pull another name for the rest. How cool is that!!! The first winner was Dorothy Pohlman from Orchard Park NY! congratulations Dorothy and thank you for allowing us to have two winners--you rock my friend! The second winner is Julie Semones! I am not sure where Julie is from but I know she is a member of the Latenight Stamper's group and I believe SUDSOL too. Thank you so much to everyone who made a donation. With the local monies I collected I was well over $1500 myself for this great cause--we HAVE made a difference. I think we are ALL winners since we helped those less fortunate! Well, the CROP Walk went off fairly well! We had no rain and it was a pleasant fall day. Little chilly but not too bad. I will guess that we will end up with about 8-9 thousand dollars when done. Not our best year but not bad considering the economy! Now it is time for me to get ready for the Chili Cookoff/Bake off that I coordinate at our church to add more funds to the CROP walk. This is one of my favorite functions of the year--I love chili and the deserts for the bake off have been fabulous--to die for! Even after all that chili. There are still a few more days for you to get in on the prize package for the online donations. 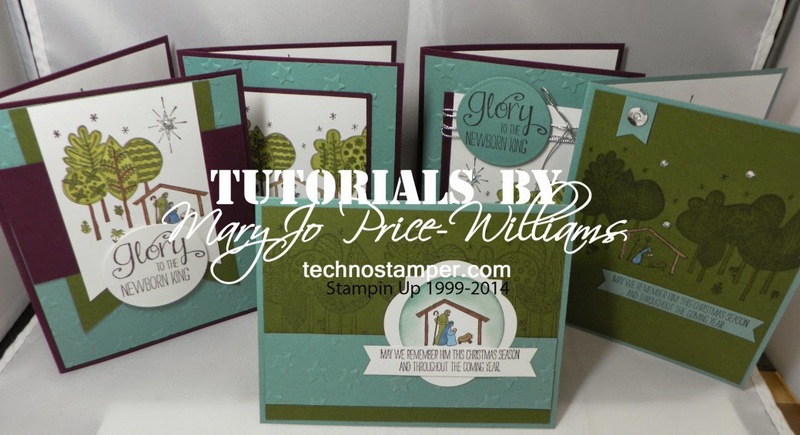 For just a $5 donation you will be entered to win more than $500 worth of Stampin Up stamps and supplies. Some from the new catalog, some old and hard to find and some that you may or may not have from various SAB and Hostess sets. 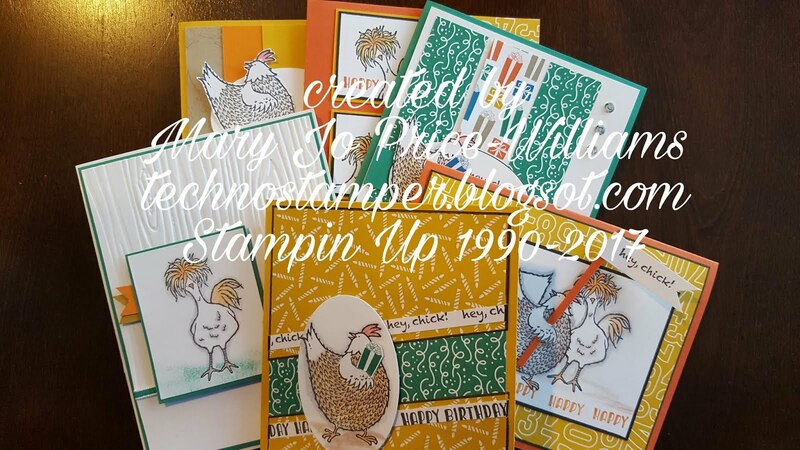 But there is so much more than just the 18 stamp sets. You got to be in it to win it. I will be picking a winner on the announce the winner on the 20th. You have until October 19th 12pm EST to donate. Thank you so much for putting others first. And now for this week's sketch. I used the MDS to make this sketch. What do you think? I really am enjoying playing with this new program but I have not had too much time with it yet. I hope you will play along. 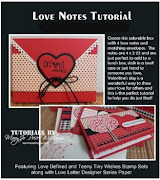 There are no real rules other than making a card and posting a link on Mister Linky below! Can't wait to see what you come up with. 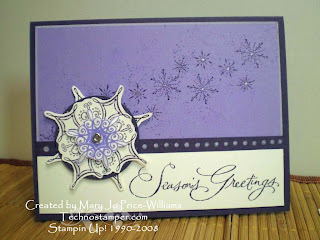 Due to time constraints this week I chose to combine this with the Latenight Stamper's Challenge for the new week. So you are getting a sneak peek at this week's challenge. I won't be posting it until tomorrow on the group. Shhhhh. I made this color challenge logo with the MDS too! The next card is obviously using the same colors and layout but looks quite a bit different, don't you think? That is it for tonight! I am exhausted. See ya tomorrow if all goes well, lol. Re-cap of sketch 90--the one that almost got lost. Wow, I am so glad I went back to this sketch after missing it the previous week and jumping to sketch 91! What fun cards. Remember you can visit the creators blogs by clicking on the links above the card. Thanks so much for playing along ladies. Great job.